IMDG Code (The International Maritime Dangerous Goods Code) is the worldwide standard for shipping hazardous materials or dangerous goods by sea. The Carriage of dangerous goods and marine pollutants in sea-going ships is respectively regulated in the International Convention for the Safety of the Life at Sea (SOLAS) and the International Convention for the Prevention of pollution from Ships (MARPOL). Relevant parts of both SOLAS and MARPOL have been worked out in great detail and are included in the Code, thus making this Code the legal instrument for maritime transport of dangerous goods and marine pollutants. As of 1st January 2004, the Code became a mandatory requirement. 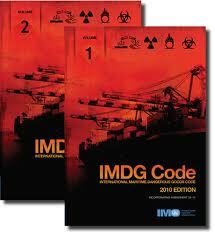 The IMDG Code is in conjunction with government regulations under SOLAS and was developed as a uniform international code for the transport of dangerous goods by sea covering such matters as packing, container traffic and stowage, with particular reference to the segregation of incompatible substances. For all modes of transport (sea, air, rail, road and inland waterways) the classification (grouping) of dangerous goods, by type of risk involved, has been drawn up by the UNITED NATIONS Committee of Experts on the Transport of Dangerous Goods (UN). The Code is amended and released in every two years, which sometimes makes shipping practitioners confused about transition periods: which volume is currently validly in use? To solve this problem, thecompliancecenter.com has compiled a chart for your ready reference. You can download the chart here.